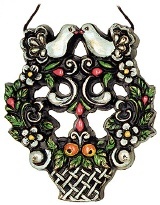 Welcome to our fascinating „Little World of Pewter“: Collectors everywhere really appreciate the high quality of our ornaments and jewellery. Year after year, our dedicated artists create new designs, working on every little detail to create a unique look. Yes, it is a long way from the idea to the finished product but we think it is worth it!. 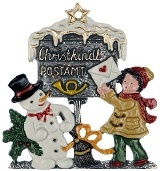 Pewter Figurine "Christkindl Post Office"
We have single and double-sided ornaments, and larger motifs for hanging on the wall or standing upright. We even have decorations for your window and flower arrangements. Never fear…you will find that perfect piece for that Special Someone! A precious combination: Glass and pewter for the extraordinary home decoration. Exclusive metal or wooden music boxes are a very special present, and we have the right motif for every occasion. Currently, there are more than 20 different designs. 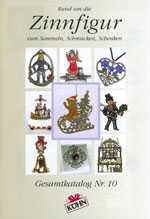 Over the years we have produced several series of pewter pictures to hang on the wall: Traditional shops, Professions, Flowers, Festivities, Musicians, Country-Living, Town Pictures and many more! 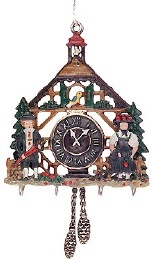 3D-Miniature "Cuckoo clock with Bavarian couple"
Christmas Tree Decoration "Star twelve-armed, Stone Ruby-coloured"
Our well known Annual Angel – dated since 1979 – headlines the annual collectors series. 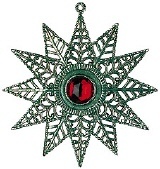 There is also a line of Christmas trees and fairytales and other motifs, available for years. These are very popular by collectors from around the world! Wine Stopper "Octagonal Wine Foliage"
Wine connoisseurs use only natural products to protect their investments. What a wonderful gift idea for a dinner-invitation: Bring a bottle of wine and a pewter cork stopper, packed together in a gift-box! 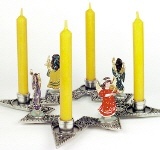 Candle holders with different motifs are a very special table decoration. 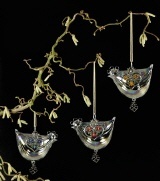 Pewter place card holders and napkins make every evening’s dinner a splendid banquet. Our brass bells are carefully hand-polished. 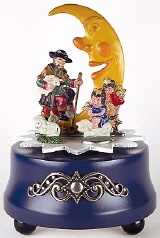 And the combining the bells with a Kühn pewter figure turns it into a unique table decoration. Everybody knows this problem: Your are sitting in the garden, enjoying your beer or wine, and suddenly you have little visitors attracted to your sweet drink… That is no problem with our pewter lids and by the way – an ideal present for the host! Everyone wants to add that unique touch to his own home. With the help of Kühn doorplates, every guest will find his way around... - no problem! Make a fashion statement with Kühn accessories in various traditional and modern styles. 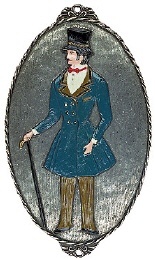 And do not forget the hat pin or brooch souvenir for the world traveller! 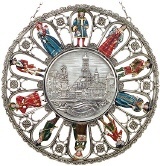 Costume Frame with Town Plaque "Augsburg"
You will also find religious motifs in the Kühn product assortment: Exquisitely modelled crosses with our beautiful antique finish as well as figures of the apostles and saints. 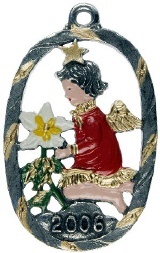 They are graceful presents for a child's first birthday or christening ceremony. 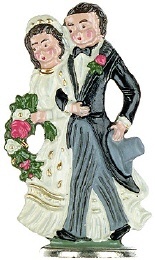 Aside from the „Little World of Pewter“, we carry very pretty hand made and painted wax ornaments. 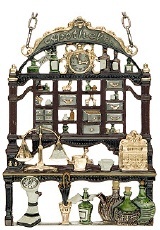 At Kühn you will also find suitable items for better decorating, presenting, storing and gift-giving of all the articles from the „Little World of Pewter“.